Most marketers probably never dreamed that, at some point, they’d be launching augmented reality marketing campaigns – screens and apps that immerse users like never before, giving them a whole new kind of brand experience. But the technology has arrived. And shoppers are increasingly looking for more than just a place to buy. They’re looking for omnichannel marketing experiences. That’s where augmented reality marketing campaigns have started to take off. When you start getting imaginative, you can build a lasting relationship with shoppers by giving them a unique journey every time they visit the store. In early October, Toys “R” Us tested out Play Chaser, an augmented reality (AR) app, across twenty-free stores. Partnering with PlayFusion, Play Chaser allows shoppers to play AR games on their mobile devices by scanning access points throughout the store. By scanning more dedicated access points, players unlock more features and experiences, including racing monster trucks and playing virtual basketball. The app also allows for players to interact with other players in the store. The retailer is now rolling it out to more stores, finding that thousands of kids are using the app. This app is an innovative way to adapt to user behavior – since kids and parents have phones already, why not engage them on their screens when they enter the store? With Play Chaser, Toys “R” Us drives foot traffic to stores, but still encourages mobile use at the same time. Starting November 1, Macy’s and Samsung are partnering to bring holiday foot traffic via a 1,000 square foot interactive display featuring Samsung’s latest and greatest technology. From TVs that turn into art displays to smart home appliances, the display’s main attraction is a virtual roller coaster. Shoppers can use Samsung’s Gear VR to board the roller coaster and go for a ride. This is almost the same thing as moving a rollercoaster into the store itself. Now, when they’re shopping at Macy’s, shoppers can take a break to have a one-of-a-kind entertainment experience. And that’s sure to keep them coming back in the future. Anthropologie has always offered in-store merchandising that inspires many shoppers to revamp their homes and closets. But, of course, there’s a problem – customers don’t know what a couch or bed will look like until it’s already in their home. 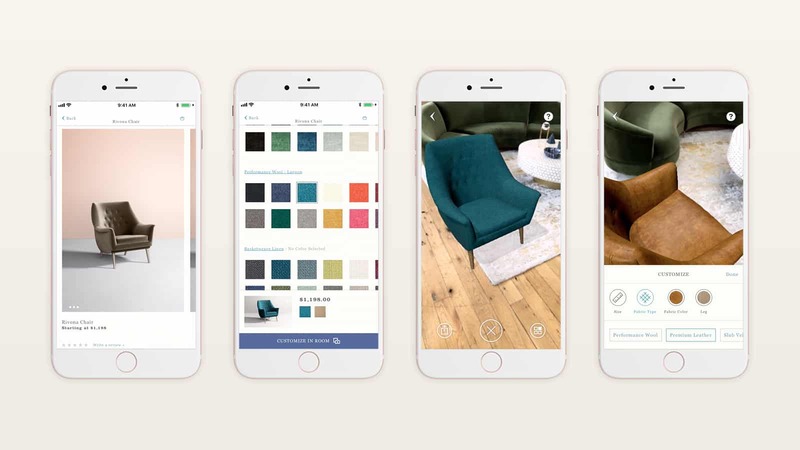 Now, the retailer has a custom furniture library app that uses augmented reality to help prospective buyers visualize the products inside their home. With the app, it’s possible to project a customized piece into an existing room and then share the proposed interior update to friends and family on social media. Any retailer that offers home goods products could benefit from a similar augmented reality solution. With this app, Anthropologie works to eliminate the risk that shoppers could return an item after costly shipping and installation. When it’s time to shop for new makeup, one of the biggest problems for customers is trying on products. Because then they have to wipe each application away after a quick trial or deal with returns. It’s time-consuming, and causes a lot of friction between shopping and purchase. 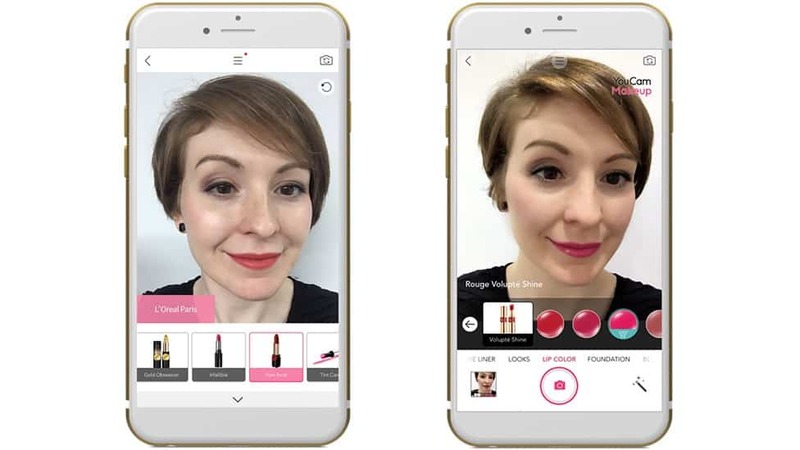 L’Oreal’s new global partnership with Perfect Corp, maker of the YouCam Makeup app, hopes to solve that issue. The YouCam MakeUp App allows users all over the world to try on different looks, whether they’re in a store or not. This experience allows users to virtually try on make-up, learning about the products, while building a user experience across every channel. This year saw the debut of Snapchat Lenses, which are meant to create augmented reality experiences wherever a wearer wants them. When branded, these lenses are a powerful marketing tool that allow your customers to engage with your brand in unexpected, share-worthy ways. According to Business Insider, lenses like Snapchat’s 3D World Lens, a sponsored lens that allows brands to feature animated branded objects such as a dancing hotdog or a mask inspired by a movie character, allows the company to build a new kind of advertising experience that brings customers into a branded world while remaining in their own homes. With a history of successful branded lens partnerships with Taco Bell, King Games, and Universal Pictures, Snapchat’s platform provides more memorable ads that can not only alter shopper perceptions of a brand, but also encourage buying decisions. Retailers and brands are always experimenting with the latest technology. What’s interesting about augmented reality is that most marketers seem to be interested in finding out how to enhance the existing in-person experience. This goes back to the importance of building an omnichannel marketing strategy that helps drive foot traffic and build customer loyalty is experience. With augmented reality, marketers are working to bridge the gap between online and offline experiences by merging the two together and delivering unique, memorable shopping journeys wherever their audience goes next.